How British beer is brewed: an expert speaks | Notes from the U.K.
“I work at a brewery and here’s what we do. “Beer in a fermenting vessel is kept at 22 degrees – which is at a temperature the yeast works best at. After so long it is cooled to 13 degrees and then a few days later to 5 degrees for a couple of days. Yeast for beer ferments at the top – hence the slow temperature drop to help the yeast settle at the bottom of the vat. This is so when we draw it off there hopefully is little yeast in the casks. In the casks a product is added to make sure in 2 days time the remaining yeast has settled to the bottom and you don’t get cloudy beer or floating yeast (which can be bitter to taste). Some bottled beers have this in, to keep the beer alive and maybe taste fresher. These are called Bottle Conditioned. Never pour a full bottle of these out into the glass. 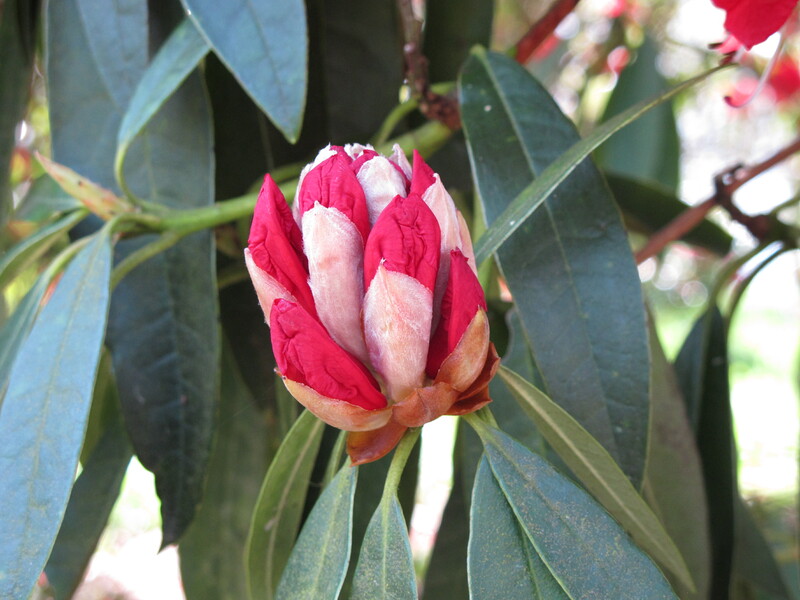 Irrelevant photo: Rhododendron getting ready to bloom. “Lager is cool fermented and requires a different yeast that is active at lower temperatures. “Now serving temperatures, there could be an argument here. We live in the 21st century and therefore we have central heating and insulation so our homes are much warmer. Back in the day a home was a lot cooler. Pub landlords, when keeping casks, have to have good cellar conditions in order to be able to serve a perfect pint. Our brewery suggests with all our beers to pop it in the fridge. However we know some beer lovers prefer ‘room temperature’ so we suggest 1 bottle in the fridge the other not, so they can decide for themselves. Try it next time you have a bottle of your favourite (even if its a Porter or Stout) don’t drink it too quick let it gradually warm up and you will start to taste different things. From this you will roughly know how you like your beer. “As for percentage – ours range from 3.8% to 9.1%. I’ve had some British beers that are over 12%. In fact quite a few forward thinking micro breweries usually have a range like ours or above. British beers are on the up. “Now Hops: Flower hops are the natural state, which is what we use in all our brews. Every hop is different in smell and taste. The hops are put in when the mash (malt/barley/oats juice – whatever you’ve used) in the kettle is boiling. If you put it in at the start of the brew, it gives it is flavour and bitterness. The later you put it in through that boiling hour the more aroma and less bitterness it gives off. Each beer is different for us in the quantity and timing. The other type is pellets. We use these in two brews and only put these in when the beer is a few days away from being put in casks, gives it a nicer whiff and a little extra taste. This entry was posted in Food and tagged Americans in Britain, Americans in England, anglophile, beer, brewing, Britain, England by Ellen Hawley. Bookmark the permalink. Yum. Just thinking about the different tastes of “cellar temperature” v “room temperature” beer made me want to open the Porter I’ve put in the ‘fridge to have with tea (even though it’s just breakfast time!). I’m an American who lives in the UK and I’ve come to worship British beers. Traveling around the country is a delight as we discover new breweries. It’s a wonderful time to be a beer lover! Some of this is wasted on me, since I’m not a beer drinker anymore, but I’m fascinated by the technicalities of it all the same. I was a wine-drinker when I immigrated. But British porters, stouts and the occasional IPA have converted me. I don’t drink much – half a pint is usually my limit (much to my husband’s delight as he gets to drink his and then the rest of mine) – but, boy, I enjoy those half-pints! Makes me want to have a beer, sitting outside a nice country pub, the smell of Spring. Lovely. Doesn’t sound like a bad plan. Isn’t it great that the Internet can put you in contact with people who know the answers to our questions? I’m going to try and remember some of these facts so I can impress my dad. Interesting and, to me, totally unexpected–which makes it all the better. What a lovely thing to say, but I can’t take credit for this post–it’s HalfPint’s work. I have been wanting to say that to you for some while. Seriously, thanks. It means a lot. Wow. Here is a detailed answer to my question. I wonder if my husband knows all this, as he knows about about alcohol brewing business. Got to show this post to him. Thanks! These are facts and info my son, who us making his own beers and wanting to start a brewery with a friend, might not know. Sharing this with him. Great. It was wonderful to hear from someone who actually knew about it.